The first inclusive rock festival was held in Vladivostok. "Art integration" brought together 16 teams. Both professional artists and people with disabilities performed on the same stage. The main purpose of the event is to enable more people to share their art, regardless of prejudices, physical and social restrictions. The last preparations on the stage of the concert complex "Underground". Sound engineers are testing equipment, lighting set up light. Everything should be perfect, because this is the first inclusive rock festival for Primorsky Krai. Nine hours in a non-stop format unite participants. It was under this motto that "Art integration"was created. A platform where performers with disabilities, professional artists, and children's groups perform. While the room warms up the band "MuzikVox", it is the youngest participants of the festival, the attention of journalists in the dressing room chained to the Wife of Nekrasov. He's the guitarist in the band "Isomorphism". I got acquainted with the instrument only two years ago. It would seem nothing unusual... except that the guy almost never sees, he has no right hand, and on the left bend just two fingers. Evgeny Nekrasov, guitarist, participant of the inclusive rock festival: "I have a little neck sawed, removed the sixth string and the fifth lowered, the so-called "split" string on the tone below." The tool adapted by itself. After all, he is a future engineer. The profession is developing in the University without any concessions, according to a regular program. After the tragedy in 2012, each new day was a small challenge to yourself. Now Eugene is working on the creation of artificial intelligence, is fond of chess, and to play the guitar professionally, came up with a unique mediator. Evgeny Nekrasov, guitarist, member of the inclusive rock festival: "This is a regular glove, called" bandage to strengthen the brush,"and on top of it sewn a mediator, which my brother cut out of a plastic spatula." The main viewer, she's critic — my mom. With a musical past behind her, she listens to every sound of the guitar and in the back row of the auditorium remembers how they together on the last call at the correctional school sang the Russian version of "Hotel California". 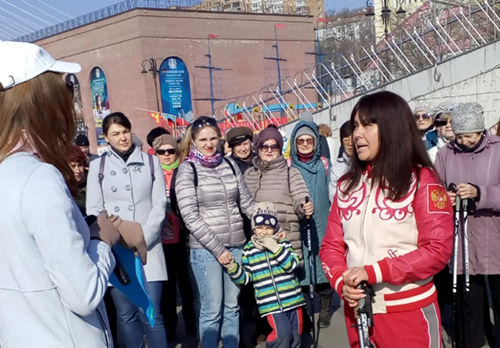 Tatiana Nekrasova, mother of Zhenya Nekrasov: "After what happened, he did not shut up, did not go into himself and began to achieve the goals that he sets." 25.05.2018 Lesozavodsk Ukrainians organize the festival "Svyatankov dews"